And more importantly, hold them to their word. You see, without taking action on the things you say, you’ll never see any results. This coaching program is about holding you to your goals and desires by making sure you FOLLOW THROUGH with what you say. There’s nothing else quite like it in the industry and it works phenomenally well. Read more here. 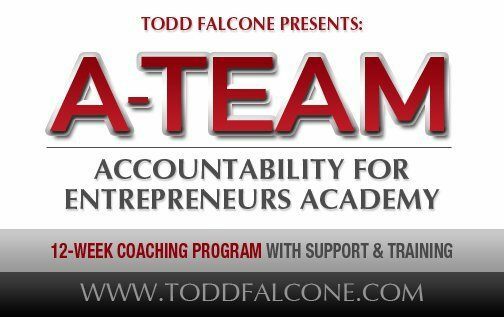 Todd Falcone's One on One Coaching program is designed to shorten your learning curve and dramatically accelerate the learning process. In this program, Todd works with you personally to assist you in making immediate and lasting change to improve your results. Production is all that matters in business, and Todd’s coaching can help you do just that... PRODUCE!